Known for its tree-lined streets and beautiful architecture Chicago’s historic Lincoln Park neighborhood is home to some of the city’s best entertainment and fine dining. Making the most of this city lot is a 3 story single family home in the heart of Lincoln Park with that embraced city life and the trendiness of the neighborhood in which it’s located. When I walked in the home I noticed can lights retrofitted with LED lamps and an iPad hanging on the wall that controlled the home’s camera system, door locks, lighting and more, all clue’s pointed to a homeowner that appreciates the benefits of a well-planned lighting system. 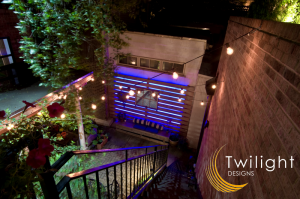 In the backyard was a small covered patio and beyond that was the backside of the detached two car garage with an iron staircase that led to the rooftop with additional seating and a BBQ. The new lighting design re-used a transformer and some existing fixtures which were relocated and retrofitted with LED. Staggered throughout the iron staircase banisters I ran some subtle and discreet firefly lights and installed some patio string lights furnished with vintage tungsten filament bulbs. 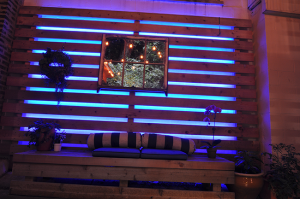 All of these lighting features were magnified by a red cedar bench with a spaced horizontal picket backdrop that with some strategically placed lighting became the focal point of the backyard and the focus of this submission. By removing the 4” horizontal cedar boards I was able to notch out the 4×4 upright posts so that lengths of LED RGB ribbon lights could be attached facing the white wall behind the bench. A separate transformer was installed in the garage inside the nearby garage to operate the 12v DC ribbon lights. Also in the garage was WiFi RGB controller which allowed the homeowner to control from his iPhone or iPad simply by logging into the new WiFi network created by the controller. The RGB lights could be mixed to create nearly any color desired in addition to the ability to dim the lights or select from a number of other lighting modes. A wireless wall switch and remote provide alternative means of controlling these lights as well and additional wiring was run back to the controller should the homeowners decide they’d like to install a second controller to incorporate additional color themes like red and green for Christmas or Purple and Orange for Halloween. Perhaps though the most dramatic aspect of this lighting feature turned out to be the hanging window pane with mirrors panels in the place of glass which mirrored the lighting scheme in the background. It created an even more pronounced perception of the depth already created by the shadow board effect which silhouetted the pillow and potted arrangements in the forefront of the seated area. 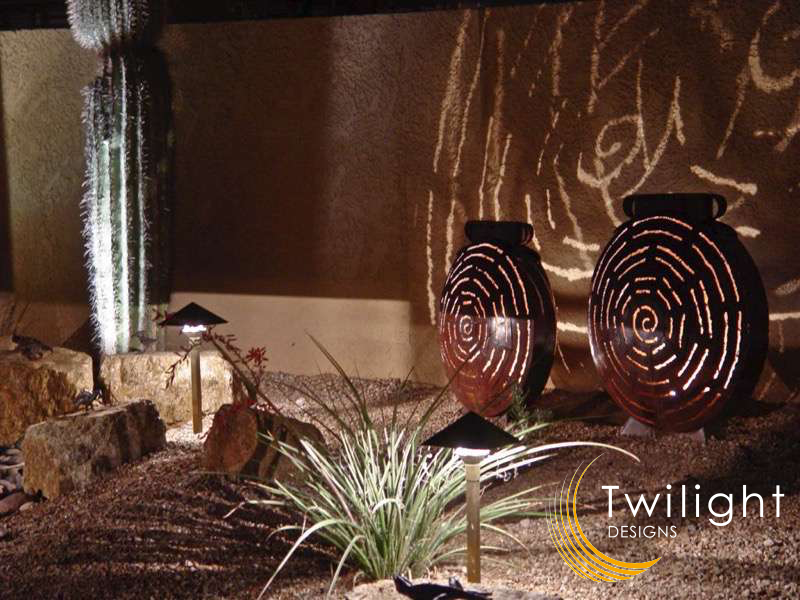 This was a front and backyard lighting project in Las Vegas Nevada that utilized a number of different lighting techniques but the artistic iron pots offered a unique opportunity for some creative lighting. The condensed size of these fixtures allowed me to cut a small hole in the bottom of each pot to insert the fixture and another 1/2″ hole made it possible to securely fasten the fixture to the inside base of each pot in a way the fixtures seemed to disappear into the bottom of the pots with no indication from the outside of what kind of fixture was providing such an effect. We left enough wire buried near each pot so that they could be moved if necessary for years maintenance or future landscape alterations as needed. 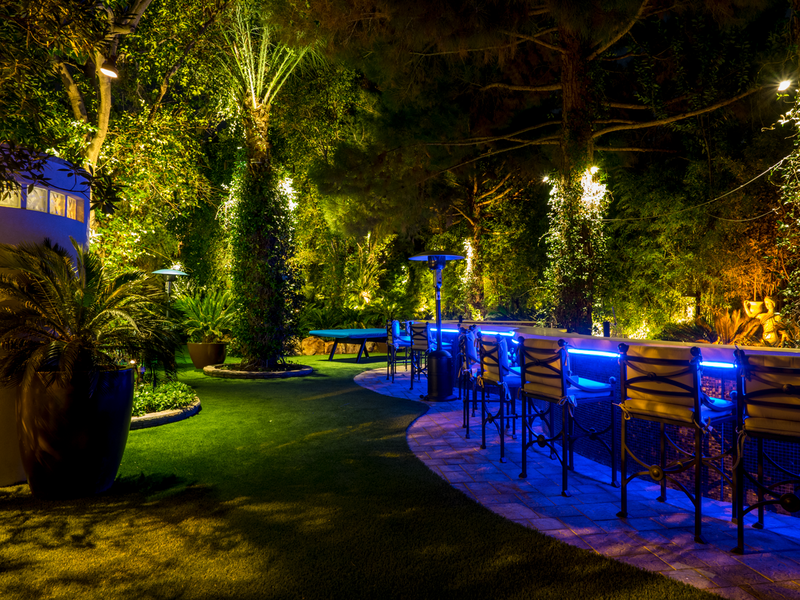 Furthermore, we chose a fixture that we could not only discretely install each pot but in a way that made them easily accessible for changing lamps and maintenance. The soft and widespread of light that these fixtures provide combined with an adjustable reflector and a 20 watt halogen bi-pin lamp allowed me to evenly illuminate the inside of these pots while creating a wonderful glowing and shadowing effect as a backdrop to the pots. The shadowing behind the pots the pots gave them a bigger than life appearance that seemed to make the whole backyard larger and made the pots a nice focal point to the backyard lighting system. Path lighting on the boulders next to the dry river bed in front of the pots allowed me to provide some low-level lighting to accent some interesting features and create some depth in s small space in a way that helped move our eyes to the focal points and give the backyard the warm inviting look that our client desired and that desert landscapes often lack. On the left side of the backyard is a small tool shed with a water feature located close enough to the shed and back wall to catch the rippling effect that light reflecting off the water created. This movement captured by the walls was especially pronounced in the desert setting which lacked trees and shrubs that typically capture the movement of the wind. The shed also made for an easily accessible location to mount a 300 watt multi-tap transformer equipped with a digital astronomical timer so that our client could run the backyard lighting system from dusk until midnight during the week and preserve energy and lamp life but also allowed them to have the system automatically run from dusk until dawn on the weekends with a battery backup for power outages and a convenient on and off button and manual code on the timer for those occasions that our client found themselves enjoying their backyard outside of the systems normal operating times during the week.